Beloved Maui is at a crossroads … It’s an opportunity to invite all the stakeholders into this discussion with the spirit of aloha, and draw on our collective manaʻo to consider how we will plan ahead to mālama ‘āina – care for and nurture the land so it can sustain life for ourselves and future generations. 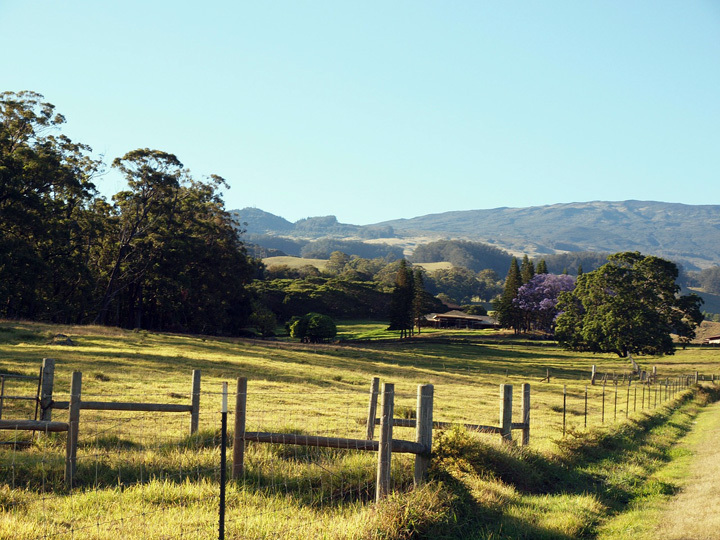 Last year, Mahi Pono, LLC, a joint venture of a California agricultural group and a Canadian pension investment manager, bought 41,000 acres of former sugar land, as well as a grass-fed cattle project, Central Maui Feedstocks and additional agricultural businesses. Planning for the repurposing of former Alexander & Baldwin holdings is underway. Decisions made now will shape the future of Maui agriculture. One of the more prominent stakeholder groups weighing in is ‘Āina First, a coalition of business professionals, farmers, scientists and community stakeholders. The group believes that regenerative agriculture and adoption of traditional Hawaiian farming practices are the keys to meeting the challenges posed by climate change. Regenerative agriculture is “a system of farming principles and practices that increases biodiversity, enriches soils, improves watersheds, and enhances ecosystem services.” Regenerative agriculture embraces practices that advance the “biosequestration” of greenhouse gas carbon dioxide out of the atmosphere and into plants and soils. Although there’s a lot to like here, a number of Maui’s new farming adherents also embrace animal agriculture, despite its cruelty, inefficiency, excessive demands on water and production of foods linked to serious diseases. One of ‘Āina First’s founders and its director of agriculture is the former president of “a company dealing with dairy cattle” that she farmed organically from 1973-1996. It may come as a shock to some to learn that Hawaii imports about 90% of its food, and if there is a disruption in the supply chain, Hawaii’s food “reservoir” is only an estimated three-10 days. In light of these facts and new opportunities to determine the future of tens of thousands of acres of Maui farmland, on March 28, ‘Āina First presented a well-attended community forum, Food Security in the Climate Change Era, How Regenerative Agriculture & Climate Action Forge Resilience & Abundance. A distinguished restoration ecologist, Mr. Apfelbaum completed more than 9,000 projects over his 40-year career working in North and South America. At the Maui forum, he focuses on the importance of soil health. “Carbon-rich soil is healthy soil, beneficial for everything on earth. Without healthy soil, we really begin to lose the values and the functions of what we so appreciate and love anywhere you happen to live, including Maui. “Global food supply chains delivering food to Maui are increasingly vulnerable,” he warns. “Most airports in coastal cities are on the coast. All ports are on the coast. They are not designed for the tidal surges that are now increasingly common. Then Mr. Apfelbaum turns to the subject of agriculture. He notes that historically, large herds of ruminants have been very destructive to landscapes and soil. The solution? Ending animal agriculture in favor of a more climate-friendly, plant-based approach? Nope. According to Mr. Apfelbaum, a practice called “adaptive multi-paddock grazing,” or AMP, which consists of frequently rotating the grazing sites of cows and other farmed animals, greatly improves soil health. In addition, some suggest that AMP mitigates greenhouse gas emissions from ruminants. Evidently, the animal suffering inherent in cattle ranching and dairy farming, the inefficient growing of grain to feed farmed animals, rather than people, the high use of water in animal agriculture and proven links between meat consumption and diseases are not worthy of concern. Jenny Pell, a Maui-based permaculture designer, consultant and educator, is on hand to expand on Maui-specific solutions. Like her colleagues, she is knowledgeable, enthusiastic, articulate and innovative. produce shade-grown coffee, which is kind to both workers and habitats. undertake a report that details Maui’s precise food needs. convert the old sugar mill into a community hub with cafes, a Farmers Market, restaurants, space for bakers, commercial kitchens, concerts, etc. promote the ecological restoration of gulches in the central valley. explore the “agrihood” model of affordable housing. Calf rescued from the Big Island Dairy. Photo by Alessandra Rupar-Weber. A mobile slaughter unit? Really? A full-service slaughterhouse, too? Maui’s “regenerative” future requires continued animal suffering, the inefficient use of water and grain and the production of unhealthful food? Now is the time for Maui to take a truly comprehensive, visionary approach and end the exploitation of animals, while increasing environmental sustainability by growing plant-based foods that promote health, not disease. As we strengthen Maui’s long-term food security, empower local Maui farmers and families, protect the soil and air and draw from tradition, we need an acceptable answer to a question raised by Maui activist Carlos Garcia.